Calling a perfume ‘black ink’ has intriguing connotations. ‘Black’ or ‘Noir(e)’ has been the perfume industry’s shorthand for ‘edgy’ ever since the 1998 launch of the striking but hard-to-wear Bulgari Black. Among the many followers in its wake we’ve had Ambre Noir, 1881 Black, Armani Privé Cuir Noir, Bois Noir, Coco Noir, Cologne Noir, Dahlia Noir, Datura Noir, Eau Noir, Fourreau Noir, even (I kid you not) Hello Kitty Noir. 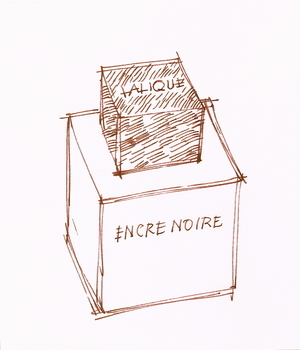 So Encre Noire (which was launched in 2006) follows a bit of a bandwagon, though at least its name is better than most. It’s a nostalgic name, since hardly anyone uses ink (black or otherwise) these days, yet it’s evocative too – I can kind of imagine the smell of black ink, even though I must have been a teenager the last time I opened an actual bottle of the stuff. Whatever you think about the name, Encre Noire is a fine addition to the many men’s perfumes to be based on the smell of vetiver, the vigorous tropical grass whose roots have a wonderful dry, earthy, slightly musky scent. My all-time favourite is Guerlain’s simply-named Vétiver, which starts with a burst of lemony freshness, but Encre Noire foresakes such tricks and sticks resolutely with vetiver all the way through. I say ‘all the way through’, but of course it’s actually a bit more complicated than that, thanks to Nathalie Lorson, senior perfumer at the giant Swiss fragrance company Firmenich. When she created Encre Noire she cleverly smoothed off some of vetiver’s rough edges, adding tiny amounts of cypress extract (which has a dry, woody, slightly resinous smell), as well as synthetic musk and so-called ‘cashmere wood’. This is actually 2,3,5,6,7-hexahydro-1,2,3,3-pentamethyl-4h-inden-4-one, a chemical sold under the brand name of Cashmeran, which is widely used in perfumery (and household products) and has a soft, gently woody smell. The final result an appealing and long-lasting perfume, though some people are always going to find vetiver too dry and bitter-smelling for their taste. As for the bottle, a black glass cube with a square wood-effect cap, I like its inkwell look, but its glossy surfaces all too quickly get smeared with fingerprints, and the lettering is so spare – just a bare ENCRE NOIRE in thin white sans-serif capitals – that (to me at least) it ends up looking a bit cheap and half-considered, though I’m sure it was anything but. Minor gripes aside, this is a fine perfume, and even if, in the end, I think it’s unlikely to supplant Guerlain’s Vétiver in my affections, I think its popularity is well deserved.